Wash the silk to get out the chemicals which can be left behind in the weaving process and which prevents the dye from flowing evenly. Dry the silk either by hanging or with an iron on damp silk. There is some folklore that says ironing will flatten the silk in such a way that less dye will adhere to the silk. I'm not sure it's true, though I have switched from ironing the silk to just hanging it after I've washed it (generally in the washing machine on delicate with slow spin dry). You must remove deep wrinkles that can cause unwanted dye to flow along a fold. I generally use either wispy silk chiffon for large scarves or heavier silk jacquard which have a design woven into the cloth for more texture, better wrinkle resistance and good drape. I never use silk Habotai, which generally is the least expensive silk you can buy, because it wrinkles badly and doesn't have much drape but if you are going to stretch and frame your silk for a painting, Haborai works well. Mark the placement of the motif if you are making a garment being careful to avoid unfortunate placement of main elements and being sure that the flow of the motif will complement the final flow of the garment. If you draw the pattern pieces on the silk, be aware that they need to be larger than the final pattern because the steam set, wash, and final dry and iron can modify the shape and size of the silk. Stretch the silk. If the silk touches anything, the dye can travel along what it is touching. Dye can also travel down a deep wrinkle. As the silk gets wet it stretches, so you may have to take up the slack as you paint to prevent it from draping down and puddling the dye. Above is silk yardage with the dress pattern outlined. 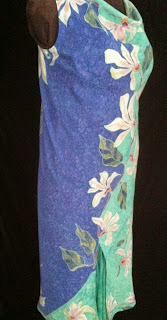 The dress is cut on the bias and has a draped neck with the pattern flowing down one side. The pattern pieces are larger than the actual pieces because steaming the silk can shrink it. Draw the main design on the silk with some form of resist. I use a water based resist called Resistad which is then colored with dye so that I can see it more easily. Some silk painters prefer gutta serti resist which needs to be dry cleaned out in wearables. Without the resist, the dye flows on the silk as long as it has liquid to carry it. Fill in the background color. I often use salt on the background to give it texture and sometimes I use 70% isopropyl alcohol to texture the background. Ispray it on with a mister and it makes lovely little dotted background. If the foreground is mostly white or pale, I sometimes fill in the background first, as in the example on this page. After the background is in, I go back into the design and add texture and more color. You often can't tell what extra coloration the design needs until the background is in. This is because the background can be affected by the humidity and color separation of the dye. Once the background is down and dry, you can better tell what else you need in the foreground. Fill in the basic design being careful not to over-saturate the silk which can cause bleeds across lines. Mixing colors from cyan, magenta, yellow and black instead of using premixed colors allows more variation in shading especially when using alcohol to “push” colors into lines and salt to draw in color to a point. You can use alcohol to dilute the color instead of water to attain more even flow of a single color, but be careful that you have really good ventilation if you use alcohol. I only put down the basic colors and wait until the background is in to put on the finishing touches of color in the foreground. Set the dye by carefully rolling the silk in paper. If the silk touches itself or another piece of silk, the dyes can transfer from one place to another. If the silk is damp when rolled in the paper, dye can transfer through the paper to adjacent silk, so be sure the dye is very dry before you steam it. You can use a blowdryer or iron to help the drying along before rollling it in paper. I use two layers of non-waxed butcher paper or unprinted newsprint between each piece of silk and on the bottom and top. Then I roll it up and put it in a huge mesh "sock" made from outdoor activewear jacket lining. Steam for 2-3 hours. Some dyes require less steam and some more. It is also possible to set some dyes with a dyeset concentrate. Each dye manufacturer tells you how to set the dye. Don't steam inside your house as the steaming paper can give off toxic chemicals. Gently wash and rinse the silk to get off the excess dyes until the water runs clear. Dry by rolling in a towel. Then iron the damp silk on the wrong side. If the silk has colored gutta serti, you may need to use a presscloth to avoid spreading the gutta serti. If the gutta serti leaves too much "feel" on the silk, you can have it dry cleaned out. I generally leave it in if I am framing it, and dryclean it out if I am selling it to wear. For more information about silk painting, see Susan Louise Moyer's excellent book Silk Painting for Fashion and Fine Art , Paula Birch's fine hand dying advice, and the Wiki page of Silk Painters International website.